Ditch your tram tickets for a torch and see a different side to Hong Kong’s most famous landmark. This urban trail is an easy way to fit in a workout whilst seeing spectacular views of the island. Simply search for the “Central Green Trail” on Google Maps and follow The Peak tram line all the way to the top. How to get there: From Admiralty / Central station, head to Hong Kong Park (across from The Peak lower terminus) and follow the stairs right beside the train tracks. Difficulty: Easy / medium – the trail is mainly a path through residential areas but involves quite a steep incline. How to get there: Go to Admiralty MTR station (Island Line/Tsuen Wan Line/South Island Line) and take Exit A. Turn left and take minibus 24M to the terminus. Then follow Mount Butler Road/Sir Cecil’s Ride to the vantage point. After soaking up the view, you can either retrace your steps and return on the 24M or follow the trail all the way to Tai Koo MTR station. Suicide Cliff, Kowloon – Not for the faint hearted! If you’re scared of heights, then you might want to sit this one out. The stomach-churning drop off of “Suicide Cliff” will make you feel as though you’re stood on the edge of the world! 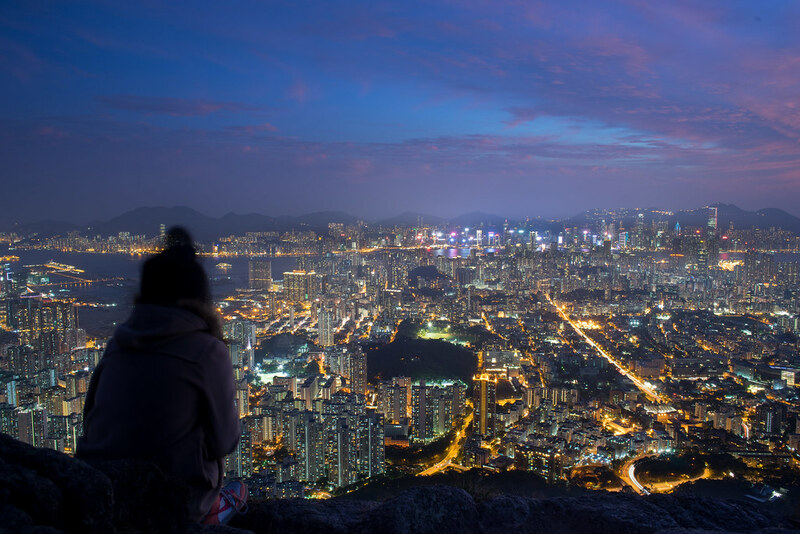 Having risen to fame thanks to the award-winning photography of Kevin Yuen, a night-hike to Suicide Cliff will show you an unmissable vista of Hong Kong. Firmly ranked as medium/hard difficulty, we recommend this to the more experienced hiker. Either head to Kwun Tong MTR, take Exit D and flag mini bus 47. Ride all the way to the last stop (Lee Ming House Shun Lee Estate) or save time and take a taxi from Choi Hung MTR Station towards Fei Ngo Shan Road and get off at the start of Pak Fa Lam Road. Look out for the ‘328’ sign, and follow the stairs up to where you’ll then see a helicopter pad and a transmission tower. Follow alongside these to reach Suicide Cliff, snap your Instagram pics and head back the same way you came to get home! Only a ten minute climb from Sham Shui Po, Garden Hill is a favourite for night photographers due to its spectacular views of Kowloon. An easy, after-work Instagram opportunity that’s guaranteed to bring in the likes! How to get there: From Exit D2 at Sham Shui Po MTR, go straight on Kwelin Street for 5 minutes until you reach Castle Peak Road. From there, you will be able to see Mei Ho House. Cross the street, head around the fence then take a left on Berwick Street where you will reach Mei Ho House. You’ll then arrive at the stairs on the left that will take you straight up to Garden Hill. Once used as a vantage point by pirates, “Devil’s Peak” gained its foreboding name way back in the Qing Dynasty. A fascinating, historical site that is home to World War Two bunkers – it allows for spectacular harbour views from an unusual angle. Go straight from the office to catch the sunset. How to get there: From Yau Tong MTR Exit A1, walk towards Lei Yue Mun road, take an immediate right and then walk towards the roundabout. Turn left down Ko Chui Road and follow the blue signs announcing the cemetery. About 500m along the road that leads to the cemetery, you will see a clear sign for the Wilson Trail that will take you to Devil’s Peak. Some nice hikes listed, however, Devil’s Peak is a part of the Wilson Trail and not the Maclehose Trail. Cheers.